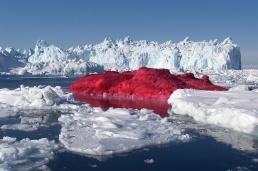 Chilean-born Danish artist Marco Evaristti's Ice Cube Project, Ilullissat, Greenland, 2004. Artist's website. Video. B-1 Crater, Yamal, Siberia, 2015. More. 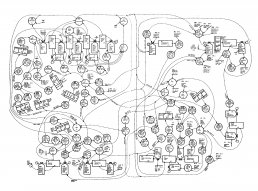 The flow diagram for the world model used for computer simulation results of which are described in Limits of Growth, 1972. More. Alexander von Humboldt & Aimé Bonpland, Géographie des plantes équinoxiales, Paris/Tübingen, 1805. 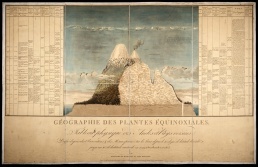 The poster for Humboldt's Essay géographie des plantes. Source. Beinecke. The Anthropocene is the latest iteration of a concept to signal the impact of collective human activity on biological, physical and chemical processes at and around the Earth’s surface. Since the early 2000s, scientists have used the term to distinguish the current accelerated man-made-geological epoch from the steady-state 10,000-year-old Holocene. It has been recognised as a useful evolutionary framework to think about the peak oil, global warming and the necessity of downshifting. This page offers a documentary genealogy of the concept of Anthropocene and its reception across the arts and sciences. By way of tracing its emergence it also maps overlaying discourses such as those of climate change and earth system. Its imagined readers are researchers and bots in the arts and humanities. The page is divided into sections to indicate entry points into various aspects of the concept, they are not mutually exclusive. Sections follow a moreless chronological pattern. Writings are in English unless noted. Bibliographic titles in colour are linked to publications publicly available online. First published on 13 June 2018. Henry de la Beche, "Awful Changes", c1833. The geologist's caricature of public scientific lecture on the fossil record and evolution of mankind. Ichthyosaurus Professor wonders how the small creature of man could possibly have such a big influence on planet Earth. Source. via Mark Williams. The term Anthropocene suggests two key notions: (i) that the Earth is now moving out of its current geological epoch, called the Holocene, and (ii) that human activity is largely responsible for it, that is, that humankind has become a global geological force in its own right. This implies new ethics, modes of science, and policies in order to manage the global environment in a rational manner. The word quickly entered the scientific literature as an expression of the degree of environmental change on Earth caused by humans. There are numerous geologically significant conditions and processes profoundly altered by human activities. These include changes in: erosion and sediment transport associated with a variety of anthropogenic processes, including colonisation, agriculture, urbanisation and global warming; the chemical composition of the atmosphere, oceans and soils, with significant anthropogenic perturbations of the cycles of elements such as carbon, nitrogen, phosphorus and various metals; environmental conditions generated by these perturbations (these include global warming, ocean acidification and spreading oceanic 'dead zones'); the biosphere both on land and in the sea, as a result of habitat loss, predation, species invasions and the physical and chemical changes noted above. Human activity began to have global effects, now layered into a geological record marked with evidence of coal extraction, atomic testing, ocean plastification, and accompanying species extinction. 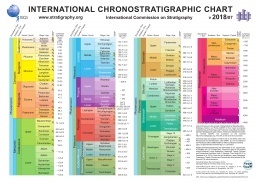 International Chronostratigraphic Chart of the International Commission on Stratigraphy, July 2018, represents the Geologic Time Scale (PDF). The current Holocene epoch is in the Quaternary period of the Ceonozoic era that is in the Phanerozoic eon. The first version of the chart dates from 2012. For a detailed explanation see Cohen et al 2013. Other formats, translations and related charts. The Anthropocene is currently under discussion as a potential formal unit of the geological time scale. Several suggestions for its beginning have been discussed in the past years: an 'early Anthropocene' some 8,000 years ago; the beginning of the Industrial Revolution at c1800 CE; and, most prominently, the start of the nuclear age, i.e. the 'Great Acceleration' of the mid-twentieth century. A formal 'Anthropocene' might be defined either with reference to a particular point within a stratal section, that is, a Global Stratigraphic Section and Point (GSSP), colloquially known as a 'golden spike'; or, by a designated time boundary (a Global Standard Stratigraphic Age, GSSA). A related question remains about a hierarchical level at which it should be placed: age, epoch or period. Since the late 1980s when the term 'Earth System' gained resonance in the IGBP framework and NASA launched Earth System Science as a structuring concept for its future research activities, a seemingly new way of understanding and studying the Earth and environmental change has gained ground among scientific institutions around the world. Building upon a view from space provided by remote sensing technology, global databases and sophisticated computer models, Earth System Science is emerging as a holistic super-discipline that tries to embrace all processes in nature and society as one interlinked system. In the context of global change, the Earth System has come to mean the suite of interacting physical, chemical, and biological global-scale cycles (often called biogeochemical cycles) and energy fluxes which provide the conditions necessary for life on the planet. The term climate system is also used in connection with global change, and is encompassed within the Earth System. Climate usually refers to the aggregation of all components of weather – precipitation, temperature, cloudiness, for example – averaged over a long period of time, usually decades, centuries, or longer. The processes which contribute to climate comprise the climate system, and they are closely connected to biogeochemical cycles. 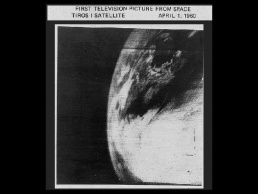 The first photo of Earth from a weather satellite, taken by the TIROS-1 satellite on 1 April 1960. Early photographs provided new information on cloud systems. Source. 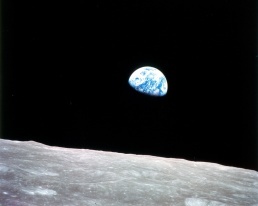 Earthrise, a photograph of the Earth and parts of the Moon's surface taken from lunar orbit by astronaut Bill Anders in Dec 1968, during the Apollo 8 mission. Video. Source. See also the Blue Marble, an image of Earth taken from Apollo 17 in 1972. 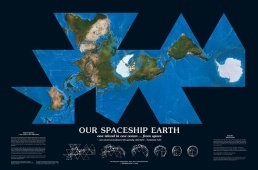 Buckminster Fuller's Airocean World Map [Dymaxion map], a projection of a world map onto the surface of an icosahedron, which can be unfolded and flattened to two dimensions. This version first made with cartographer Shoji Sadao in 1954 depicts the Earth's continents as "one island", or nearly contiguous land masses. See also Fuller 1943.
on a live audio-visual presentation in 1983. Explores the idea that the Earth is an integrated, self-regulating living organism and asks what function humanity might have for this planetary being. biosphere. Suess 1909, Vernadsky 1926.
noösphere. de Chardin (1925)/1957, Vernadsky 1926. Spaceship Earth. Boulding 1966, Ward 1966, Fuller 1969. Gaia. Lovelock 1972, Lovelock & Margulis 1974, Lovelock 1979, Lovelock 1988. Hutton, James, "Theory of the Earth", Transactions of the Royal Society of Edinburgh 1:2 (1788), Edinburgh, pp 209-304; repr. as Theory of the Earth, 2 vols., Edinburgh: Creech, 1795; vol. 3, ed. Archibald Geikie, London: Geological Society, 1899. Argues that the Earth is not a stable, divine creation, but under constant change due to interacting geological and biological phenomena. Hutton's theory was popularised through Charles Lyell's Principles of Geology (1833) and is now considered foundational to modern geology. Wikipedia. The Face of the Earth, trans. Hertha B.C. Sollas, Oxford: Clarendon Press, 1908. "Hominization: Introduction to a Scientific Study of the Phenomenon of Man", in Teilhard de Chardin, The Vision of the Past, trans. J.M. Cohen, New York: Harper and Row, 1967, pp 51-79. The Biosphere, trans. David B. Langmuir, rev. & annot. Mark A.S. McMenamin, intro. Jacques Grinevald, New York: Copernicus Books and Springer, 1998, 192 pp. Vernadsky, W.I., "The Biosphere and the Noösphere", American Scientist 33:1 (1945), pp 1-12. Sees the dawn of the noösphere as the ‘last of many stages in the evolution of the biosphere’ and was signalled by the human transformation of its chemistry, including the transmutation of its elements, a task soaked in utopian promise. Johnstone, J., "Enthropy and Evolution", Philosophy 7:27 (1932), Cambridge UP, pp 287-298. "If we assume certain physical conditions, mass, temperature, etc., of the original earth-filament, it should (with greater knowledge than we now possess, of course) be possible to construct a system of equations that would represent all phases of the earth-system from its initial one to that ultimate phase which we envisage in the remote future" (291). Tansley, A.G., "The Use and Abuse of Vegetational Concepts and Terms", Ecology 16:3 (Jul 1935), pp 284-307. Devises the concept of ecosystem to draw attention to the importance of transfers of materials between organisms and their environment. Extends Clements' earlier term "biome" for "the whole complex of organisms inhabiting a given region" with the "whole system (in the sense of physics), including not only the organism-complex, but also the whole complex of physical factors forming what we call the environment of the biome. [..] [W]e cannot separate [the organisms] from their special environment, with which they form one physical system" (299). Boulding, K.E., "The Economics of the Coming Spaceship Earth", in Environmental Quality in a Growing Economy: Essays from the Sixth RFF Forum, eds. K.E. Boulding and H. Jarrett, Baltimore: Published for Resources for the Future by the Johns Hopkins Press, 1966, pp 3-14. Ward, Barbara, Spaceship Earth, New York: Columbia UP, 1966, viii+152 pp, OL. Uses the metaphor to draw attention to the uneven allocation of resources and opportunities between the global North and South. Fuller, R. Buckminster, Operating Manual for Spaceship Earth, Carbondale: Southern Illinois UP, 1969. Note the difference between the Gaia concept (Lovelock 1972), Gaia hypothesis (Lovelock & Margulis 1974, Lovelock 1979), and Gaia theory (Lovelock 1988). Lovelock, J.E., "Gaia as Seen Through the Atmosphere", Atmospheric Environment 6:8 (1972), Pergamon Press, pp 579-580. First paper outlining the Gaia concept. Lovelock, James E., Lynn Margulis, L. (1974). "Atmospheric Homeostasis by and for the Biosphere: the Gaia Hypothesis", Tellus, 26:1-2 (1974), Stockholm: International Meteorological Institute, pp 2-10. Frames the Gaia concept as a hypothesis of "atmospheric homeostasis by and for the biosphere." Lovelock, James E., Gaia: A New Look at Life on Earth, Oxford UP, 1979; 3rd ed., 2000. Extends the Gaia hypothesis to encompass regulation of aspects of the composition of the ocean, including its salinity. Lovelock, James, The Ages of Gaia: A Biography of Our Living Earth, Oxford UP, 1988, OL; 2nd ed., 1995. Outlines the Gaia theory, altering and abandoning some of the tenets of Gaia hypothesis (following strong and constructive criticisms of the 1979 book, esp. Doolittle 1981 and Dawkins 1983), namely: the notion of regulation “by and for the biosphere” was rejected with the realisation that it is the whole system of life and its material environment at the surface of the Earth (Gaia) that self-regulates; the notion of regulation in an optimum state was broadened to regulation in a habitable state; the notion of homeostasis was restricted to specific cases and time intervals and self-regulation adopted as a more general term. With these changes, the Gaia theory was presented as a framework for understanding the Earth as a system and its development over time. Images of the "new fossil types" marking the Era of Mind, from Dana 1864: 240. 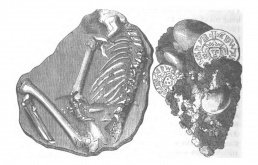 At left is a "human skeleton from Guadaloupe"; at right is a "conglomerate containing coins". Source. 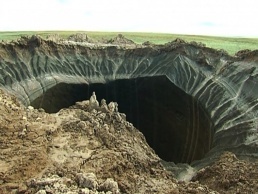 A crater in the frozen Yamal peninsula in Siberia found in mid-2014. 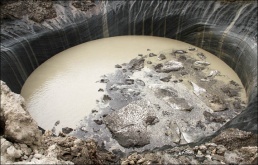 The 40 metre deep and 30 metre wide crater was formed when methane released as permafrost thawed. Air near the bottom of the crater contained unusually high concentrations of methane. Its release has been linked to the abnormally hot Yamal summers of 2012 and 2013, which were warmer than usual by an average of about 5°C. As temperatures rose, permafrost thawed and collapsed, releasing methane that had been trapped in the icy ground. By mid-2015, the crater was filled with water almost up to it's rim. Greek and Roman authors gave vivid reports about man's devastating impacts on their Mediterranean "Arcadia". Scientists have noted the extent of human influence on planet Earth at least since the latter half of the 19th century. 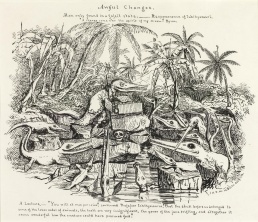 George Perkins Marsh’s Man and Nature (1864) is an early major work to focus on anthropogenic global change, while the Italian geologist Antonio Stoppani (1873) used the term "Anthropozoic" to denote the time of this transformation. Later on, physical chemist Svante Arrhenius (1896) and geologist Thomas Chamberlain (1897) were exploring the relationship between CO2 concentrations in the atmosphere and global warming. Arrhenius suggested that future generations of humans would need to raise surface temperatures to provide new areas of agricultural land and thus feed a growing population. Throughout the 20th century the idea of an epoch of the natural history of the Earth, driven by humankind, was discussed on more occasions. In 1988, NASA scientist James E. Hansen had testified to Congress about climate, specifically referring to global warming, following which popular use of the term exploded. In 2000, the Nobel Prize-winning atmospheric chemist Paul Crutzen (then of Max-Planck-Institute of Chemistry) and freshwater biologist Eugene F. Stoermer (U Michigan) employed the concept of the Anthropocene for a related matter. Age of Mind, Era of Mind, Age of Man. Dana 1859, Dana 1864. Anthropozoic Era. Stoppani 1873, Marsh 1874. Psychozoic era. LeConte 1877, Schuchert 1918, Vernadsky 1924.
climate change, global warming. Arrhenius 1896, Chamberlain 1897, Broecker 1975, Hansen 1988.
degrowth, décroissance. Meadows 1972, Illich 1973, Georgescu-Roegen 1979.
the Anthropocene. Crutzen & Stoermer 2000, Crutzen 2002. See also section History of science, technology and environment. Crutzen & Stoermer 2000 refer to Stoppani, Marsh, Vernadsky, de Chardin and Le Roy as among the first to recognize the growing role of humankind as a "significant geological, morphological force". Steffen et al. 2011 refer to these and some others (Bergson, Osborn, Schuchert, Sherlock) as antecedents of the current idea of modern humankind as a new geological agent on a global scale, although they caution against drawing an equivalence with earlier concepts. Hamilton & Grinevald 2015 cite Stoppani, Renevier, LeConte, Schuchert, Dana and de Chardin as authors who described the impact of human action on "the face of the Earth". The website of Anthropocene Working Group identifies Stoppani, LeConte, Vernadsky and de Chardin as precursors of the term Anthropocene. Dana, James D., "Anticipations of Man in Nature", The New Englander 17, 1859, pp 294-334. Geology professor of Yale University says that "the present age, the Age of Mind, is that towards which all the preceding ages were preparatory." Dana, James D., "Era of Mind – Age of Man", in Dana, A Text-book of Geology, Philadelphia, PA: Theodore Bliss, 1864, pp 236-243. A standard geology textbook for decades. "Referred to most post-glacial strata as the ‘Era of Mind – Age of Man’. In his formulation, this was not simply a symbolic description. Dana enumerated the characteristic rocks and life of each major division of geologic time, and the Age of Man was treated similarly, with a discussion of depositional patterns and types and of the characteristic fauna. Dana wrote that there were ‘large additions of species’ at the beginning of the period ‘especially of those adapted to promote Man’s physical, intellectual, and moral progress, through their nutritions or healing virtues, their strength and beauty, and their power of multiplying the necessities of labor and the evils of indolence’ (p. 238)". Marsh, George Perkins, Man and Nature, or, Physical Geography as Modified by Human Action, New York: C. Scribner, 1864; rev.ed. as The Earth as Modified by Human Action, New York: Scribner, Armstrong and Co, 1874; rev.ed., 1885; repr., Arno Press, 1970. An account of the impact of industrialisation and deforestation. The first to quantify human-induced environmental change on an international scale. Revised edition from 1874 discusses Stoppani 1873. "First Period of Anthropozoic Era", trans. Valeria Federeighi, eds. Etienne Turpin and Valeria Federeghi, in Making the Geologic Now, eds. Ellsworth and Kruse, Punctum Books, 2012; repr. in Scapegoat 5: "Excess" (Summer/Fall 2013), pp 346-354. Trans. of excerpt. Schuchert, C., The Earth's Changing Surface and Climate During Geological Time", in The Evolution of the Earth and its Inhabitants, eds. J. Barrell, et al., New Haven, CT: Yale UP, pp. 45-81. Arrhenius, Svante, "On the Influence of Carbonic Acid in the Air upon the Temperature of the Ground", London, Edinburgh and Dublin Philosophical Magazine and Journal of Science 5:41 (Apr 1896), pp 237-275. Explores the relationship between CO2 concentrations in the atmosphere and global warming. Suggested that future generations of humans would need to raise surface temperatures to provide new areas of agricultural land and thus feed a growing population. Chamberlain, Thomas, "A Group of Hypotheses Bearing on Climatic Changes", Journal of Geology 5 (Oct-Nov 1897), pp 653-683. Matthews, William H., William Kellogg, and G.D. Robinson (eds. ), Man's Impact on the Climate, MIT Press, xviii+594 pp. Review: Hammond (Science). Inadvertent Climate Modification: Report of the Study of Man's Impact on Climate (SMIC), MIT Press, 1971, xxiv+308 pp. Review: Hammond (Science). Broecker, Wallace S., "Climatic Change: Are We on the Brink of a Pronounced Global Warming? ", Science 189, 8 Aug 1975, pp 460-463. Hansen, James E., "The Greenhouse Effect: Impacts of Current Global Temperature and Regional Heat Waves", 100th Cong., 1st sess., 23 Jun 1988. Testimony of Director of NASA Goddard Institute for Space Studies (GISS) to the United States Senate Committee on Energy and Natural Resources. Hansen said: "global warming has reached a level such that we can ascribe with a high degree of confidence a cause and effect relationship between the greenhouse effect and the observed warming." His testimony was very widely reported in popular media, and after that popular use of the term global warming exploded. Video. NYT coverage. Meadows, Donella H., Dennis L. Meadows, Jørgen Randers, and William W. Behrens III, The Limits to Growth, New York: Universe Books, 1972; 2nd ed., 1974; 3rd ed. as Limits to Growth: The 30-Year Update, 2004. The Earth is a finite system, which means it has limited resources. Based on the computer simulation of exponential economic and population growth, the report found that business as usual would lead to "sudden and uncontrollable decline in both population and industrial capacity". Wikipedia. Illich, Ivan, Tools for Conviviality, Calder & Boyars, 1973, 125 pp. Analyzes growth not as an economic ideology, but as the result of a historically unique mindset that turns tools from means into ends, and calls for a "convivial" society "in which modern technologies serve politically interrelated individuals rather than managers" (12). Revkin, Andrew C., Global Warming: Understanding the Forecast, Abbeville Press, NY, 1992, 180 pp. Excerpt. "Perhaps earth scientists of the future will name this new post-Holocene period for its causative element—for us. We are entering an age that might someday be referred to as, say, the Anthrocene [sic]. After all, it is a geological age of our own making" (55). A book on the basics of greenhouse-driven global warming and policy implications written to accompany the first museum exhibition on climate change, at the American Museum of Natural History. Creative Evolution, trans. Arthur Mitchell, London: Macmillan, 1911, xv+425 pp; New York: H. Holt, 1911. Sherlock, R.L., Man as a Geological Agent, foreword A.S. Woodward, London: Witherby, 1922, 372 pp. Osborn, F., Our Plundered Planet, Boston: Little, Brown, 1948. Thomas, W.L. (ed. ), Man's Role in Changing the Face of the Earth, 2 vols., University of Chicago Press, 1956; repr. as single vol., 1971, 1236 pp. Based on the 1955 symposium at Princeton. Publisher. See also Naredo & Gutiérrez 2005. Glacken, Clarence J., "Changing Ideas of the Habitable World", in Vol. 1, 1956, pp 70-92. Human impact on Earth was a well-known theme within naturalistic and geological thinking from the time of the Western industrial revolution. Glacken, Clarence J., Traces on the Rhodian Shore: Nature and Culture in Western Thought from Ancient Times to the End of the Eighteenth Century, Berkeley: University of California Press, 1967; repr., 2011. A large, scholarly treatment of the development of ideas about human modifications of nature up to the end of the 18th century. Clark, William, R.E. Munn (eds. ), Sustainable Development of the Biosphere, Cambridge UP, 1986, viii+491 pp. Project of IIASA devoted to the effects of human activities within the biosphere and to forecasts about probable future developments therein. Review: Cloudsley-Thompson (1988). Turner II., B.L., W.C. Clark, R.W. Kates, J.F. Richards, J.T. Mathews, W.B. Meyer (eds. ), The Earth as Transformed by Human Action: Global and Regional Changes in the Biosphere Over the Past 300 Years, Cambridge UP, 1990. Meyer, William B., Human Impact on the Earth, Cambridge UP, 1996.
carbon cycle (marine). Richardson & Hanson 2004.
carbon cycle (terrestrial). Scholes 2004. Earth System. Oldfield & Steffen 2004. Earth System stewardship. Brasseur 2003, Folke et al 2011, Steffen et al 2011b. Earth System tipping points. Lenton and Williams 2013. Gaia. Lenton 2004; criticism: Crutzen 2004.
global change syndromes. Schellnhuber et al 1997, Reenberg 2011.
nitrogen cycle (global). Galloway 2004.
planetary boundaries. Rockström et al 2009, ICSU 2011, Biermann 2012, Griggs et al 2014; criticism: Nordhaus et al 2012. Second Copernican revolution. Schellnhuber 1999.
in 1984 to explain the gaia hypothesis. Source. IGBP phase 2 structure (2006) in which core projects conformed to either individual components of the Earth system, the interfaces between them, or integration across the Earth system components. Major global environmental change organizations, 2012. Source. 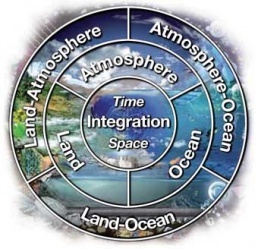 The paradigm of Earth system science emerged in the 1980s and took institutional form in the International Geosphere-Biosphere Program (IGBP) established by the International Council of Scientific Unions (ICSU, since 1998 the International Council of Science). The concept of IGBP was first outlined in NRC report from July 1983 workshop chaired by Herbert Friedman. This report was presented to the ICSU General Committee at a colloquium in Warsaw in August 1983, subsequentially elevated to an international level in the September 1984 General Assembly in Ottawa (ICSU 1985 proceedings), and recommended in ICSU 1986 report to the General Assembly held in September 1986 in Berne, that eventually established Special Committee for the IGBP. ICSU found its role model of organising international research cooperation in its earlier initiative, the International Geophysical Year (1957-1958), originally set out to gather data related to understanding the behaviour of the atmosphere above the Arctic and Antarctic. On the national academic level in the US, the IGBP's development had been coordinated by the NRC's Committee on Global Change (CGC) established upon recommendation in OSTP 1985 with its priorities outlined in NRC 1986 and NRC 1988. The IGBP was formally established in 1988 with its secretariat located at the Royal Swedish Academy of Sciences in Stockholm. Parallel to this initiative, after initial steps in 1982 NASA workshop (NASA 1982), the Earth System Sciences Committee (ESSC) was appointed in 1983 by the NASA Advisory Council to consider directions for NASA's Earth-sciences program. Chaired by metheorologist Francis Bretherton, the committee produced NASA 1986 report, later expanded in NASA 1988. In 1986, lacking representation in the IGBP, the social science community (i.e. geographers) started efforts to launch an independent global change program through the International Social Science Council (ISSC) and their Human Dimensions Program initiative (HDP). First established in 1990, the initiative however had not gained momentum. In 1996, geographer Eckart Ehlers helped to reestablish the program as the IHDP in Bonn, with ICSU being an additional sponsor next to ISSC. The United Nations University became the third sponsor in 2006. In addition, concerns about the possible global role of ozone depletion led to the Montreal Protocol in 1987, and appreciation of the possible consequences of anthropogenic climate change led to the establishment of the Intergovernmental Panel on Climate Change (IPCC) in 1988. 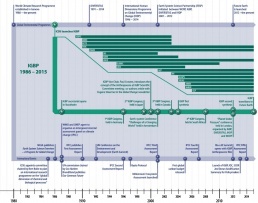 Besides IGBP and IHDP, ICSU had supported another two Global Environment Change (GEC) programs: the World Climate Research Program (WCRP) established together with the World Meteorological Organization (WMO) in 1980 in response to climate change threats (co-sponsored by UNESCO since 1993), and a program on biological diversity, DIVERSITAS, established together with UNESCO in 1991 and relaunched as a GEC program in 2002. The jointly organised July 2001 Amsterdam conference brought the four programs (climate, Earth system science, biodiversity, human dimensions) into establishing an Earth System Science Partnership (ESSP) for cross-cutting initiatives (see Amsterdam Declaration). Upon recommendation of ICSU's 2007-2008 review of the partnership (ICSU IGFA 2008), the General Assembly of ICSU decided in 2011 to merge the programs into a new 10-year research platform for global sustainability (ICSU 2011), Future Earth, announced at Rio+20 conference in June 2012 and in operation since 2013. For broader histories of Earth system science see Uhrqvist 2014 (focuses on IGBP and IHDP), Uhrqvist & Lövbrand 2014 (IGBP and IHDP), Kwa 2006 (IGBP), #Dahan2010 (IGBP), Uhrqvist & Lövbrand 2009 (ESSP), Ignaciuk et al 2012 (ESSP), Uhrqvist 2013 (START), Hamilton & Grinevald 2015: 3-4 and Uhrqvist & Linnér 2015 (Future Earth); for history of IPCC see Bolin 2007, for IHDP Mooneya et al 2013. Future Earth, a 10-year research platform for global sustainability, dir. Paul Shrivastava (since 2015). Announced in June 2012 at the UN Conference on Sustainable Development (Rio+20); launched 1 January 2013 as the continuation of Earth System Science Partnership (ESSP). Brings together the International Geosphere-Biosphere Programme (IGBP, closed at the end of 2015), the International Human Dimensions Programme (IHDP, closed in 2014) and Diversitas (closed at the end of 2014); and is affiliated with the World Climate Research Programme (WCRP). "Open to scientists of all disciplines, natural and social, as well as engineering, the humanities and law." Earth System Governance Project, a social science research network, established 2009 by IHDP. Chair of the steering group: Frank Biermann. Working Group on the Anthropocene of Subcommission on Quarternary Stratigraphy. Established 2009, convenor Jan Zalasiewicz, secretary Colin Waters. Currently developing a proposal to formalise the Anthropocene as a geological unit within the Geological Time Scale. First meeting 2014 at HKW, Berlin (Program, Video 1, Video 2, Video 3). Summary of evidence published 2017. Goody, Richard, et al., Global Change: Impacts on Habitability. A Scientific Basis for Assessment ('Goody report'), A Report by the Executive Committee of a Workshop Held at Woods Hole, Mass., June 21-26, Pasadena, CA: JPL NASA, Jul 1982, vi+15 pp. 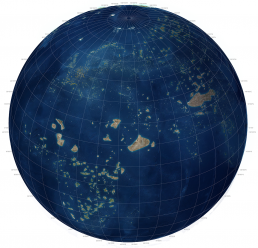 Presents the 'global habitability' concept. The "report responds to a request by the NASA for the establishment of a group to discuss the viability of a major research initiative in the area of global habitability, specifically addressed to the question of changes, either natural or of human origin, affecting that habitability [..] The changes [..] should be of significance within a human life span (50 to 100 years)." The workshop had 50 attendees, including Crutzen and Margulis. National Research Council (NRC), Toward an International Geosphere-Biosphere Program: A Study of Global Change ('Friedman report'), Report of a National Research Council Workshop, Woods Hole, Mass., July 25-29, 1983, Washigton, DC: National Academy Press, 1983, xiii+81 pp. Outlines the concept of an International Geosphere-Biosphere Program (IGBP), an earth sciences initiative as a "step toward revealing the physical, chemical, and biological workings of the Sun--Earth system", i.e. investigating interrelationships between "ocean-atmosphere interactions, biogeochemical cycles, and solar-terrestrial relationships" (vii). See also NRC 1986 and NRC 1988. Malone, Thomas, and Juan Roederer (eds. ), Global Change, ICSU Press and Cambridge UP, May 1985, xxviii+512 pp. Proceedings of Sep 1984 symposium held in Ottawa after it was suggested by the ICSU General Committee at a colloquium in Warsaw in Aug 1983 (following a presentation of NRC 1983 report therein). Proposes a "cooperative, interdisciplinary, international program to illuminate the complex and synergistic physical, chemical, and biological processes in the Sun--Earth system that determine its changes", the IGBP. Review: Walker (1986). Office of Science and Technology Policy (OSTP), Earth Sciences Research in the Civil Space Program, Washington, DC: Executive Office of the President, Oct 1985, v+34 pp. A study ordered by a Presidential Directive to define the goals and missions of federal agencies in earth sciences research. Also recommended the creation of a standing advisory committee on global change research under the NRC (19), which led to the formation of the NRC's Committee on Global Change (CGC), later renamed the NRC's Board on Global Change, serving as the U.S. Committee for the IGBP. National Research Council (NRC), Global Change in the Geosphere-Biosphere: Initial Priorities for an IGBP, Washington, DC: National Academy Press, Jan 1986, xii+91 pp. See also NRC 1983 and NRC 1988. 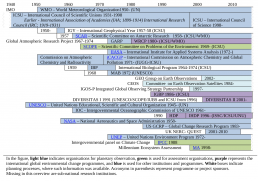 NASA Earth System Sciences Committee (ESSC), Earth System Science: Overview. A Program for Global Change ('Bretherton report'), Washington, DC: National Aeronautics and Space Administration, May 1986, 48 pp. A report of the ESSC committee appointed in Nov 1983 by the NASA Advisory Council to consider directions for NASA's Earth-sciences program. "The goal of earth system science [is] to obtain a scientific understanding of the entire Earth System on a global scale by describing how its component parts and their interactions have evolved, how they function, and how they may be expected to continue to evolve on all timescales" (26). See also NASA 1988.
International Council of Scientific Unions (ICSU), The International Geosphere-Biosphere Programme: A Study of Global Change, Final Report of the Ad Hoc Planning Group, Prepared for the 21st General Assembly, Berne, 14–19 September 1986, International Council of Scientific Unions, 4 Aug 1986, 21 pp. Chaired by Bert Bolin. Final report of the ICSU group authorised in 1984 to review relevant ongoing activities of bodies in the ICSU family and other organisations and to decide on the planning of an IGBP; a Special Committee for the IGBP was established. Suggests the view from space as a means of facilitating a 'quantum leap' forward in human understanding of the environment. List of further IGBP reports. NASA Earth System Science Committee (ESSC), Earth System Science: A Closer View. A Program for Global Change ('Bretherton report' extended), Washington, DC: National Aeronautics and Space Administration, Jan 1988, 208 pp. An extended report of the committee. See also NASA 1986. ICSU-IGFA, Review of the Earth System Partnership (ESSP), Paris: ICSU, 2008, 64 pp. Following recommendation of the review, in 2011 the General Assembly of ICSU decided "to establish a major new interdisciplinary research initiative of 10-year duration on Earth system sustainability in collaboration with other partners of the Alliance; and to recognize the initiative as an Interdisciplinary Body," Future Earth. ICSU, Earth System Research for Global Sustainability: A New 10-Year Research Initiative, Paris: ICSU, 2011, 12 pp. The Amsterdam Declaration on Global Change, 2001. 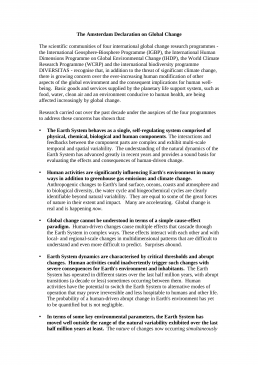 Moore III, Berrien, Arild Underdal, Peter Lemke, and Michel Loreau, The Amsterdam Declaration on Global Change, 13 Jul 2001, HTML, HTML; printed in Challenges of a Changing Earth, Springer, 2002, pp 207-208. "Research carried out over the past decade under the auspices of the four programmes [..] has shown that:  The Earth System behaves as a single, self-regulating system comprised of physical, chemical, biological and human components;  Human activities are significantly influencing Earth's environment in many ways in addition to greenhouse gas emissions and climate change;  Global change cannot be understood in terms of a simple cause-effect paradigm;  Earth System dynamics are characterised by critical thresholds and abrupt changes. Human activities could inadvertently trigger such changes with severe consequences for Earth’s environment and inhabitants;  In terms of some key environmental parameters, the Earth System has moved well outside the range of the natural variability exhibited over the last half million years at least" (207). The declaration also articulates the description of the emerging Anthropocene discourse: "Anthropogenic changes to Earth’s land surface, oceans, coasts and atmosphere and to biological diversity, the water cycle and biogeochemical cycles are clearly identifiable beyond natural variability. They are equal to some of the great forces of nature in their extent and impact" (207). See also ESSP 2012. Brito, Lidia, and Mark Stafford Smith, State of the Planet Declaration, London, 29 Mar 2012. Outcome of a second joint Open Science Conference on Global Change held in London in Mar 2012, 'Planet Under Pressure: New Knowledge Towards Solutions' which gathered 3000 scientific decision-makers. Summarises research of the four GEC organisations as follows: "A1. Humanity’s impact on the Earth system has become comparable to planetary-scale geological processes such as ice ages. Consensus is growing that we have driven the planet into a new epoch, the Anthropocene, in which many Earth-system processes and the living fabric of ecosystems are now dominated by human activities; A2. The Earth system is a complex, interconnected system that includes the global economy and society, which are themselves highly interconnected and interdependent; A3. Assessments of current mechanisms for governing global environmental change show why existing international arrangements are not dealing quickly enough with current global challenges such as climate change and biodiversity loss. See also Amsterdam Declaration. National Research Council (NRC), Earth Observations from Space: History, Promise, and Reality, Washington, DC: National Academy Press, 1995. Executive summary, xvi+10 pp. Bolin, Bert, A History of the Science and Politics of Climate Change: The Role of the Intergovernmental Panel on Climate Change, Cambridge UP, 2007. Ignaciuk, A., M. Rice, J. Bogardi, J.G. Canadell, S. Dhakal, J. Ingram, R. Leemans, and M. Rosenberg, "Responding to Complex Societal Challenges: A Decade of Earth System Science Partnership (ESSP) Interdisciplinary Research", Current Opinion on Environmental Sustainability 4 (2012), pp 147-158. Mooneya, Harold A., Anantha Duraiappahb, and Anne Larigauderie, "Evolution of natural and social science interactions in global change research programs", Proceedings of the National Academy of Sciences of the USA 110 (26 Feb 2013), pp 3665-3672. Seitzinger, Sybil P., et al., "International Geosphere–Biosphere Programme and Earth System Science: Three Decades of Co-evolution", Anthropocene 12 (Dec 2015), pp 3-16. Weart, Spencer R., The Discovery of Global Warming, Harvard UP, 2003; 2008. Traces the origins of Earth System science to the shrinking budgets for research in the United States (150); also asserts that the ESSC emerged as a NASA-coordinated response, with the aim of creating a coordinated framework with which to study the planet as a whole and, perhaps more pragmatically, in order to secure funding in a time when Cold War research could no longer be depended upon to do so. Kwa, Chunglin, "Local Ecologies, Global Science: Discourses and Strategies of the International Geosphere-Biosphere Programme. Social Studies of Science, 35:6 (2005), pp 923-950. Examines the impact of the interdisciplinary cooperation within the IGBP on ecology and the ecologists’ response; shows how ecology as a field, with its attention to local relations, navigated in a research structure dominated by the global perspectives which dominated geophysics. Kwa, Chunglin, "The Programming of Interdisciplinary Research through Informal Science-Policy Interactions", Science and Public Policy 33:6 (2006), pp 457-467. Argues that the interdisciplinary design of the IGBP was strategic work on the part of science policymakers and funders to steer research towards policy relevance and make more out of steadily diminishing budgets. / Connects the interdisciplinary work done by the IGBP to the question of funding, showing that the ICSU organised the IGBP in a new way, in that the programme designed and promoted a bold research agenda while suggesting that funding should be applied for from the national funding agencies; soon, science-policy officials reclaimed the initiative via the International Group of Funding Agencies for Global Change research (IGFA), which worked to assess the programmes and coordinate funding. Oldroyd, David, Earth Cycles: A Historical Perspective, Westport, CT: Greenwood Press, 2006, xiv+234 pp. Review: Dott (2008). Uhrqvist, Ola, and Eva Lövbrand, "Seeing and Knowing the Earth as a System – Tracing the History of the Earth System Science Partnership", 2009, 27 pp. Dahan, Amy, "Putting the Earth System in a Numerical Box? The Evolution from Climate Modeling Toward Global Change", Studies In History and Philosophy of Science Part B: Studies In History and Philosophy of Modern Physics 41 (2010), pp 282-292. Uhrqvist, Ola, "Governing through Knowledge: START and the Expansion of Global Environmental Research", in Interpretive Approaches to Global Climate Governance: (De-)constructing the Greenhouse, eds. Chris Methmann, Delf Rothe and Benjamin Stephan, Routledge, 2013, pp 152-165. Uhrqvist, Ola, and Eva Lövbrand, "Rendering Global Change Problematic: The Constitutive Effects of Earth System Research in the IGBP and the IHDP", Environmental Politics 23:2 (2014), pp 339-356. Uhrqvist, Ola, Seeing and Knowing the Earth as a System: An Effective History of Global Environmental Change Research as Scientific and Political Practice, Linköping University, Sep 2014, 91 pp. Dissertation. Traces "the history of the present scientific articulations of the Earth System"; "primarily based on archival analyses of program and project documentation produced by the IGBP and IHDP" in the period 1983-2013. Uhrqvist, Ola, and Björn-Ola Linnér, "Narratives of the Past for Future Earth: The Historiography of Global Environmental Change Research", Anthropocene Review 2:2 (2015), pp 159-173. See also Earth System Governance book series from MIT Press, 2010ff. A simplified version of the Bretherton Diagram (1986) from the National Center for Atmospheric Research, a conceptual model of the functioning of the Earth system in time scales of decades to centuries where human forces have become prominent (if not dominant). This figure was an important driving force for the conceptualization of subsequent Earth system research programs (WCRP, IHDP, and IGBP). First created by meteorologist Francis P. Bretherton and published in NASA 1986: 19 ; repr. in NRC 1995: 149 ; redrawn in Mooney et al 2013. Detailed version of the Bretherton diagram, 1986. First published in NASA 1986: 24-25 ; redrawn in Cornell et al 2012: 9. 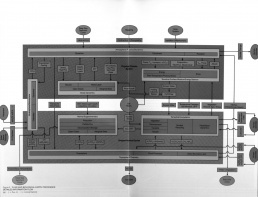 The Social Process Diagram, 1992. In the earlier Bretherton diagram (1986), human activities are depicted as a single element, affecting land use and water and emitting pollutants, and affected primarily by climate change and changes in terrestrial ecosystems. 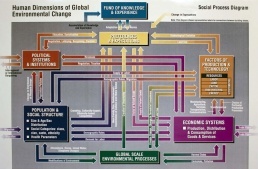 This diagram attempts to map out the key systems and interactions among systems that were seen as underpinning the human drivers ("human dimensions") of global environmental change. Developed from discussions of the Human Interactions Working Group of CIESIN, which had been funded by NASA to forge a link between the natural and social sciences in the context of global change research. First published in Kuhn et al 1992: 32-33 ; redrawn in Cornell et al 2012: 12 and Mooley et al 2013: suppl. Human dimension was first considered marginal (see the box on the left in Bretherton diagram), to receive more attention with the inclusion of social scientists in research (see The Social Process Diagram). As was explicitly stated in the report from the NASA Earth System Science Committee (NASA-ESSC, 1988), a key part of the new approach to global change studies of Earth System science was the expanded timeframe, which proposed that the Earth's dynamic system should be understood on all timescales. This contrasted with earlier attempts to study global change, both at NASA and elsewhere; Goody and the global habitability programme had primarily focused on timescales from a human perspective, since this was thought to be most relevant for policymakers. Forrester, Jay W., World Dynamics, Cambridge, MA: Wright-Allen Press, 1971; 2nd ed., 1973, 144 pp. A pioneering work on world dynamics in the World II model, which also underpinned simulations of global dynamics in the Club of Rome's report, Limits to Growth. Edwards, Paul N., A Vast Machine: Computer Models, Climate Data, and the Politics of Global Warming, MIT Press, 2010, 528 pp. Author. "A historical account of climate science as a global knowledge infrastructure." Gramelsberger, Gabriele, and Johann Feichter, "Modelling the Climate System: An Overview", in Climate Change and Policy: The Calculability of Climate Change and the Challenge of Uncertainty, eds. G. Gramelsberger and J. Feichter, Heidelberg; New York: Springer, 2011, pp 9-90. Heymann, Matthias, Gabriele Gramelsberger, and Martin Mahony (eds. ), Cultures of Prediction, Routledge, 2017, 256 pp. Discusses the ongoing developments in atmospheric science (weather and climate science) due to the use of computers and algorithms and links them with historical developments. Research project. Publisher. Litfin, Karen T. (ed. ),The Greening of Sovereignty in World Politics, MIT Press, 1998. Publisher, . Explores how state sovereignty is being reconfigured as a consequence of global environmental politics. Hulme, Mike, "Problems with Making and Governing Global Kinds of Knowledge", Global Environmental Change 20:4 (2010), pp 558-564. Uses climate change "to examine three facets of the global environmental change paradigm: making global kinds of knowledge, globalising environmental values and the governance of knowledge-making." Jasanoff, Sheila, "A New Climate for Society", Theory, Culture & Society, 27:2-3 (2010), pp 233-253. Radcliffe, S.A., Watson, E.E., Simmons, I., Fernandez-Armesto, F., Sluyter, A., "Environmentalist Thinking and/in Geography", Progress in Human Geography 34:1 (2010), pp 98-116. "Simplified [global] models can give decision-makers a false sense of confidence that the problems are easy to identify and the solutions straightforward to implement" (104). Pulizzi, James J, "Predicting the End of History: Mathematical Modeling and the Anthropocene", Minnesota Review 83 (2014), pp 83-92. Atmosphere & Algorithms (Freie U Berlin, 2010-12), Shaping Cultures of Prediction: Knowledge, Authority, and the Construction of Climate Change (Aarhus U, 2013-17). For assessment of the field see Steffen et al 2004, a synthesis of the IGBP research with contributions from Diversitas, IHDP and WCRP. For comprehensive assessment of climate change see IPCC 2013-14 reports. Kuhn, William, et al. Pathways of Understanding: The Interactions of Humanity and Global Environmental Change. University Center, University Center, MI: Consortium for International Earth Science Information Network (CIESIN), May 1992, 56 pp. Established late 1989 as NASA's affiliated data distribution centre, in 1992 CIESIN's members included five American universities. This publication results from a meeting of a Human Interactions Working Group convened by CIESIN (dir. William Kuhn and Harold Jacobson) at the Aspen Global Change Institute in 1991. Includes the Social Process Diagram. Steffen, W., J. Jäger, D.J. Carson, and C. Bradshaw (eds. ), Challenges of a Changing Earth: Proceedings of the Global Change Open Science Conference, Amsterdam, The Netherlands, 10-13 July 2001, Springer, 2003, xvi+216 pp. From the first open science conference on global change jointly organised by IGBP, IHDP, WCRP and Diversitas; followed by the establishment of ESSP. Conference website, Publisher, IGBP website. Steffen, Will, et al., Global Change and the Earth System: A Planet Under Pressure, Berlin: Springer, 2004, xii+332 pp. Synthesises research from IGBP's first phase. Cornell, Sarah, I. Colin Prentice, Joanna House, and Catherine Downy, Understanding the Earth System: Global Change Science for Application, Cambridge UP, Sep 2012, xxv+267 pp. Draws on the work by Quantifying and Understanding the Earth System (QUEST), an UK-led research programme. Publisher. Review: Matschullat (2014). Future Earth, Future Earth Initial Design: Report of the Transition Team, Paris: ICSU, 2013, 98 pp. Synthesises the first decade of internationally coordinated Earth System research. IPCC, Climate Change 2013: The Physical Science Basis. Contribution of Working Group I to the Fifth Assessment Report of the Intergovernmental Panel on Climate Change, eds. T.F. Stocker, D. Qin, G.-K. Plattner, M. Tignor, S.K. Allen, J. Boschung, A. Nauels, Y. Xia, V. Bex and P.M. Midgley, Cambridge UP, Sep 2013. IPCC. IPCC, Climate Change 2014: Impacts, Adaptation, and Vulnerability. Contribution of Working Group II to the Fifth Assessment Report of the Intergovernmental Panel on Climate Change, eds. C.B. Field, V.R. Barros, D.J. Dokken, K.J. Mach, M.D. Mastrandrea, T.E. Bilir, M. Chatterjee, K.L. Ebi, Y.O. Estrada, R.C. Genova, B. Girma, E.S. Kissel, A.N. Levy, S. MacCracken, P.R. Mastrandrea, and L.L. White, Cambridge UP, Mar 2014. IPCC. IPCC, Climate Change 2014: Mitigation of Climate Change. Contribution of Working Group III to the Fifth Assessment Report of the Intergovernmental Panel on Climate Change, eds. O. Edenhofer, R. Pichs-Madruga, Y. Sokona, E. Farahani, S. Kadner, K. Seyboth, A. Adler, I. Baum, S. Brunner, P. Eickemeier, B. Kriemann, J. Savolainen, S. Schlömer, C. von Stechow, T. Zwickel and J.C. Minx, Cambridge UP, Apr 2014. IPCC. IPCC, Climate Change 2014: Synthesis Report, eds. The Core Writing Team, Rajendra K. Pachauri and Leo Meyer, 2014. IPCC, Global Warming of 1.5°C. An IPCC Special Report on the impacts of global warming of 1.5°C above pre-industrial levels and related global greenhouse gas emission pathways, in the context of strengthening the global response to the threat of climate change, sustainable development, and efforts to eradicate poverty, eds. V. Masson-Delmotte, P. Zhai, H.-O. Pörtner, D. Roberts, J. Skea, P.R. Shukla, A. Pirani, Moufouma-Okia, C. Péan, R. Pidcock, S. Connors, J.B.R. Matthews, Y. Chen, X. Zhou, M.I. Gomis, E. Lonnoy, Maycock, M. Tignor, and T. Waterfield, Geneva: World Meteorological Organization, Feb 2019. Jointly prepared by Working Groups I, II and III. It is the first IPCC Report to be collectively produced by all three Working Groups, symbolizing the new level of integration sought between Working Groups during AR6. This bibliography is aimed for scientists interested in reception of the concept in the arts and humanities, as well as for humanities scholars, artists and researchers interested in developments in earth sciences. It offers a glimpse from the rapidly growing literature concerning the anthropocene. 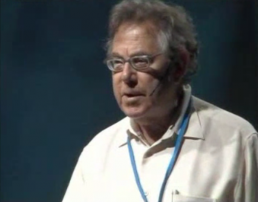 A talk by Paul Crutzen at the 56th Lindau Nobel Laureate Meeting on Chemistry, 2006. Video. The term Anthropocene was first popularized by Dutch chemist Paul J. Crutzen in his paper published in 2002 in Nature. References to the concept soon began to appear in scientific publications on hydrospheric, biospheric, and pedospheric research. As both an acknowledgement of this informal nomenclature and an attempt to reify it in scientific terms, in 2007, the British stratigrapher Jan Zalasiewicz, then serving as chairman of the Geological Society of London’s Stratigraphy Commission, asked his colleagues to review the merits of its claims. Crutzen, Paul J., Eugene F. Stoermer, "The 'Anthropocene'", Global Change Newsletter 41, Stockholm: Royal Swedish Academy of Sciences, May 2000, pp 17-18. "To emphasize the central role of mankind in geology and ecology" the authors propose using "the term 'anthropocene' for the current geological epoch. [..] To assign a more specific date to the onset of the 'anthropocene' seems somewhat arbitrary, but we propose the latter part of the 18th century, although we are aware that alternative proposals can be made (some may even want to include the entire holocene). However, we choose this date because, during the past two centuries, the global effects of human activities have become clearly noticeable. This is the period when data retrieved from glacial ice cores show the beginning of a growth in the atmospheric concentrations of several 'greenhouse gases', in particular CO2 and CH4. Such a starting date also coincides with James Watt's invention of the steam engine in 1784." Crutzen, Paul J., "Geology of Mankind: The Anthropocene", Nature 415 (Jan 2002), p 23. Introductory talk by the head of the Anthropocene Working Group, Jan Zalasiewicz, at the group's inaugural meeting at HKW, Berlin, 17 Oct 2014. Video. Talk by the head of IGBP, James P.M. Syvitski, at the inaugural meeting of the Anthropocene Working Group at HKW, Berlin, 17 Oct 2014. Video. The increasing rates of change in human activity since the beginning of the Industrial Revolution (on the left) and global-scale changes in the Earth System (on the right). (Steffen et al 2004: 132-3) . Updated in IGBP 2010, ; published in Anthropocene Review 2(1), 2015. Anthropocene, ed. Anne Chin, Elsevier, since Sep 2013. Subscription access. Elementa: Science of the Anthropocene, eds. Detlev Helmig, Donald R. Zak, Anne R. Kapuscinski, Joel D. Blum, Jody W. Deming and Michael E. Chang, BioOne, since Dec 2013. Oldfield, Frank, Anthony D Barnosky, John Dearing, Marina Fischer-Kowalski, John McNeill, Will Steffen, and Jan Zalasiewicz, "The Anthropocene Review: Its Significance, Implications and the Rationale for a New Transdisciplinary Journal", The Anthropocene Review 1:1 (Apr 2014), pp 3-7. 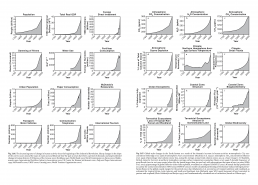 Steffen, Will, et al., "The Anthropocene Era: How Humans are Changing the Earth System", ch. 3 in Steffen et al., Global Change and the Earth System: A Planet Under Pressure, Springer, 2004, pp 81-142. Schellnhuber, Hans Joachim, Paul J. Crutzen, William C. Clark, Martin Claussen, and Hermann Held (eds. ), Earth System Analysis for Sustainability, MIT Press, Oct 2004, xiv+454 pp. Publisher, Oct 2005 article. Report of the 91st Dahlem Workshop held May 2003 in Berlin. Reviews: Galvin (2005), Hamilton-Smith (2005). Ehlers, Eckart, and Thomas Krafft (eds. ), Earth System Science in the Anthropocene, New York: Springer, 2006, xvi+268 pp. Publisher. Zalasiewicz, Jan, The Earth After Us: The Legacy That Humans Will Leave in the Rocks, Oxford University Press, 2008, 272 pp. Philosophical Transactions of the Royal Society 369(1938): "The Anthropocene: A New Epoch of Geological Time? '", eds. Mark Williams, Jan Zalasiewicz, Alan Haywood and Mike Ellis, Mar 2011. Rendiconti Lincei 25(1): "Anthropocene: Natural and Man-made Alterations of the Earth’s Fragile Equilibrium", eds. Maria Bianca Cita and Giuseppe Orombelli, Springer, Mar 2014. Subscription access. Waters, C.N., J.A. Zalasiewicz, M. Williams, M.A. Ellis, and A.M. Snelling (eds. ), A Stratigraphical Basis for the Anthropocene, London: Geological Society, Jun 2014, 321 pp. Publisher, Online First. In part arising from the Geological Society meeting on the Anthropocene in May 2011. "Describes geological evidence of human-induced environmental change to help constrain definition of the Anthropocene as a potential geological time unit." Review: Migoń (2014). Kelly, Jason M., Philip Scarpino, Helen Berry, James Syvitski, and Michel Meybeck (eds. ), Rivers of the Anthropocene, University of California Press, Nov 2017, 240 pp. Based on research project. Ruddiman, William F., "The Anthropogenic Greenhouse Era Began Thousands of Years Ago", Climatic Change 61 (2003), pp 261-293. Proposes the "early anthropogenic hypothesis" that "late Holocene anthropogenic intervention caused CH4 and CO2 increases that kept climate from cooling and that preindustrial pandemics caused CO2 decreases and a small cooling" . Steffen, Will, Paul J. Crutzen, and John R. McNeill, "The Anthropocene: Are Humans Now Overwhelming the Great Forces of Nature? ", Ambio 36:8 (2007), pp 614-621. Rockström, Johan, et al., "Planetary Boundaries: Exploring the Safe Operating Space for Humanity", Ecology and Society 14:2 (2009). Zalasiewicz, Jan, Mark Williams, Alan Haywood, and Michael Ellis, "The Anthropocene: A New Epoch of Geological Time? ", Philosophical Transactions of the Royal Society 369:1938 (Mar 2011), pp 835-841. Zalasiewicz, Jan, et al., "Stratigraphy of the Anthropocene", Philosophical Transactions of the Royal Society 369:1938 (Mar 2011), pp 1036-1055. Ruddiman, William F., "The Anthropocene", Annual Review of Earth and Planetary Sciences 41 (May 2013), pp 45-68. Abstract. Outlines the evidence for atmospheric greenhouse gas increases in response to the early impacts of Old World farming from Neolithic times onwards; suggests an informally defined two-stage Anthropocene, pre-industrial and post-1850. Zalasiewicz, Jan, Colin N. Waters, Mark Williams, Anthony D. Barnosky, et al., "When did the Anthropocene begin? A mid-twentieth century boundary level is stratigraphically optimal", Quaternary International (2014), pp 1-8. Proposes the world's first nuclear bomb explosion, on July 16th 1945 at Alamogordo, New Mexico, as the boundary of the Anthropocene geological time interval. "Additional bombs were detonated at the average rate of one every 9.6 days until 1988 with attendant worldwide fallout easily identifiable in the chemostratigraphic record." Steffen, Will, Wendy Broadgate, Lisa Deutsch, Owen Gaffney, Cornelia Ludwig, "The Trajectory of the Anthropocene: The Great Acceleration", The Anthropocene Review, Jan 2015. 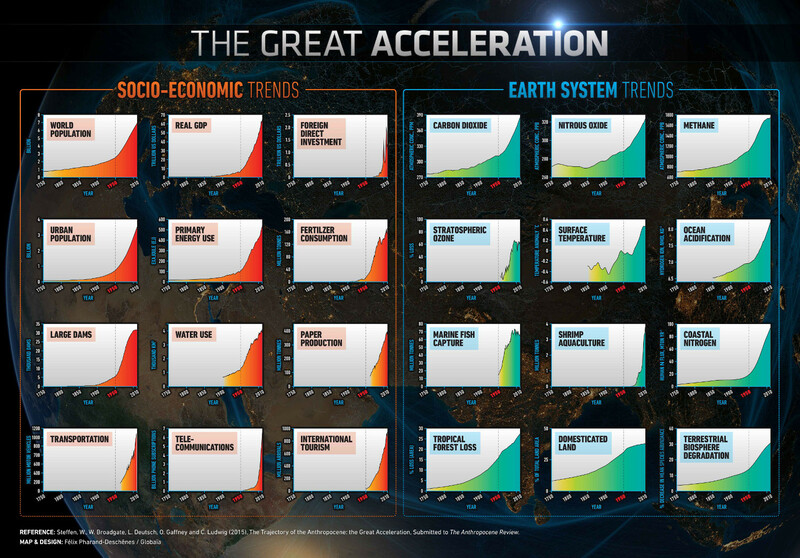 The 2010 update of the ‘Great Acceleration’ graphs, originally published in 2004 to show socio-economic and Earth System trends from 1750 to 2000, shows that "of all the candidates for a start date for the Anthropocene, the beginning of the Great Acceleration is by far the most convincing from an Earth System science perspective." Zalasiewicz, Jan, et al., "The Working Group on the Anthropocene: Summary of Evidence and Interim Recommendations", Anthropocene 19 (Sep 2017), pp 55-60. A preliminary summary of the study by the Working Group since 2009, presented at the 35th International Geological Congress in Cape Town, South Africa, in August 2016. "The majority opinion within the AWG holds the Anthropocene to be stratigraphically real, and recommends formalization at epoch/series rank based on a mid-20th century boundary." Ellis, Erle, "Anthropocene", The Encyclopedia of Earth, Sep 2013. Zalasiewicz, Jan, Mark Williams, and Colin N. Waters, "Anthropocene", in Keywords for Environmental Studies, eds. Joni Adamson, William A. Gleason and David N. Pellow, NYU Press, 2016, pp 14-16. Excerpt. TOC. Publisher. Steffen, Will, Jacques Grinevald, Paul Crutzen and John McNeill, "The Anthropocene: Conceptual and Historical Perspectives", Philosophical Transactions of the Royal Society 369:1938 (Mar 2011), pp 842-867. Sayre, Nathan F., "The Politics of the Anthropogenic", The Annual Review of Anthropology 41 (2012), pp 57-70. Zalasiewicz, Jan, and Mark Williams, The Goldilocks Planet: An Earth History of Climate Change, Oxford University Press, Mar 2012, 336 pp. Publisher. Reviews: Eyles (2012), Williams (2013). Palsson, G., et al., "Reconceptualizing the ‘Anthropos’ in the Anthropocene: Integrating the Social Sciences and Humanities in Global Environmental Change Research", Environmental Science & Policy 28 (2013), pp 3-13. Clark, Nigel, "Geoengineering and Geologic Politics", Environment and Planning A, 45:12 (2013), pp 2825-2832. Barry, J., Mol, A. and Zito A., "Climate Change Ethics, Rights, and Policies: An Introduction", Environmental Politics 22:3 (2013), pp 361-376. Refers to the fusing together of human and non-human histories as the post-natural ontology of the Anthropocene. Clark, N., 2014, "Geo-Politics and the Disaster of the Anthropocene", Sociological Review 62, SUPPL1, pp 19-37. Yusoff, K., A Billion Black Anthropocenes or None, University of Minnesota Press, 2018, xiv+115 pp. A critical race studies perspective examining how the grammar of geology is foundational to establishing the extractive economies of subjective life and the earth under colonialism and slavery. Planetary boundaries research on the website of Stockholm Resilience Center. Anthropocene on the website of British Geological Society, eds. Mike Ellis and Simon Price. Schmitz, Oswald J., The New Ecology Rethinking a Science for the Anthropocene, Princeton University Press, 2016, 256 pp. Publisher. Review: Ione (Leonardo). The most common point of departure in popular discussions of the Anthropocene in mainstream media is the environmental crisis. Ehlers, Eckart, Das Anthropozän. Die Erde im Zeitalter des Menschen, Darmstadt: Wissenschaftliche Buchgesellschaft, 2008, 284 pp. (German) Reviews: Jilka, Borsdorf (2009). Rockström, Johan, et al., "A Safe Operating Space for Humanity", Nature 461 (2009), pp 472-475. Zalasiewicz, A, Williams, M., Steffen, W. and Crutzen, P., 2010, The New World of the Anthropocene, Environ. Sci. Technol 44, pp. 2228-2231. Kolbert, Elizabeth, "Enter the Age of Man", National Geographic 219:3 (Mar 2011), pp 60-85. L'Âge de l'Homme. Construire le monde de demain à l’ère de l’Anthropocène, trans. Nicolas Vergnaud, intro. Paul Josef Crutzen, Gallimard, Sep 2012. (French) Publisher. The Anthropocene: The Human Era and How it Shapes our Planet, foreword Paul J. Crutzen, trans. Lucy Renner Jones, Santa Fe and London: Synergetic Press, 2014, 248 pp. Book website, Excerpt, Publisher. Crutzen, Paul J., Christian Schwägerl, "Living in the Anthropocene: Toward a New Global Ethos", Yale Environment 360, 24 Jan 2011. Monbiot, George, How Did We Get into This Mess? Politics, Equality, Nature, London: Verso, Feb 2016. Publisher. Klein, Naomi, "Capitalism Killed Our Climate Momentum, Not “Human Nature”", The Intercept, 3 Aug 2018. Response to Nathaniel Rich's "Losing Earth", New York Times Magazine, 1 Aug 2018. Klein argues that the NYT's historical take on the climate crisis misses the biggest historical event of the era: the neoliberal revolution. See also Kate Aronoff's response in The Nation. Naredo, José Manuel, and Luis Gutiérrez (eds. ), La incidencia de la especie humana sobre la faz de la Tierra (1955-2005), Granada: University of Granada and Manrique Foundation, 2005. (Spanish) Based on the seminar held at the Fundacion César Manrique in Lanzarote in 2003, having the reference point in the 1955 Princeton symposium. RCC Perspectives 3: "Anthropocene: Envisioning the Future of the Age of Humans", ed. Helmuth Trischler, Munich: Rachel Carson Center for Environment and Society, 2013, 76 pp. Gibson, Katherine, Deborah Bird Rose, and Ruth Fincher (eds. ), Manifesto for Living in the Anthropocene, Brooklyn, NY: Punctum Books, Apr 2015, 182 pp, PDF. Moore, Jason W. (ed. ), Anthropocene or Capitalocene? Nature, History, and the Crisis of Capitalism, Oakland, CA: PM Press, May 2016, xii+222 pp. Texts by Christian Parenti, Eileen Crist, Justin McBrien, Donna J. Haraway, Elmar Altvater, and Daniel Hartley. Publisher. Reviews: Knight (Marx & Phil), Brown (Goose), Angus (C&C). Haraway, Donna, Staying with the Trouble: Making Kin in the Chthulucene, Duke University Press, Sep 2016, xv+296 pp, PDF, EPUB. Reviews: Archie Davies (Antipode), Matt Thompson (Savage Minds). Tsing, Anna Lowenhaupt, Heather Anne Swanson, Elaine Gan, and Nils Bubandt (eds. ), Arts of Living on a Damaged Planet: Ghosts and Monsters of the Anthropocene, University of Minnesota Press, May 2017, 368 pp. Publisher. Theory, Culture & Society 34(2-3): "Geosocial Formations and the Anthropocene", 2017. Hörl, Erich, and James Burton (eds. ), General Ecology: The New Ecological Paradigm, Bloomsbury Academic, 2017, xv+384 pp. Davis, Heather, and Zoe Todd, "On the Importance of a Date, or Decolonizing the Anthropocene", ACME: An International Journal for Critical Geographies 16:4, 2017, pp 761-780. Braidotti, Rosi, and Maria Hlavajova (eds. ), Posthuman Glossary, Bloomsbury Academic, Feb 2018, xxxii+538 pp. Howe, Cymene, and Anand Pandian (eds. ), Anthropocene Unseen: A Lexicon, Brooklyn, NY: Punctum Books, forthcoming Autumn 2018. Publisher. Povinelli, Elizabeth A., Geontologies: A Requiem to Late Liberalism, Duke University Press, 2016, xii+218 pp. Cultural Anthropology: "Lexicon for an Anthropocene Yet Unseen", eds. Cymene Howe and Anand Pandian, Society for Cultural Anthropology, 2016ff. Haraway, Donna, Noboru Ishikawa, Gilbert Scott, Kenneth Olwig, Anna L. Tsing, and Nils Bubandt, "Anthropologists Are Talking – About the Anthropocene", Ethnos 81:3, 2016, pp 535-564. Tsing, Anna Lowenhaupt, "A Threat to Holocene Resurgence Is a Threat to Livability", in The Anthropology of Sustainability, eds. Marc Brightman and Jerome Lewis, Palgrave Macmillan, 2017, pp 51-65. "Archaeology of the Anthropocene", ed. Matt Edgeworth, section 'Forum' in Journal of Contemporary Archaeology 1:1 (May 2014), Sheffield: Equinox Publishing, pp 73-132. Started out as a session in the Theoretical Archaeology Group (TAG) conference at U Chicago in May 2013. Lövbrand, E., Stripple, J. & Wiman, B., "Earth System Governmentality Reflections on Science in the Anthropocene", Global Environmental Change-Human and Policy Dimensions 19:1 (2009), pp 7-13. Biermann, Frank, et al., "Navigating the Anthropocene: the Earth System Governance", Current Opinion in Environmental Sustainability, 2:3 (2010), pp 202-208. Biermann, Frank, et al., "Navigating the Anthropocene. Improving Earth System Governance", Science 335 (16 Mar 2012), pp 1306-1307. Biermann, Frank, "Planetary Boundaries and Earth System Governance: Exploring the Links", Ecological Economics 81 (2012), pp 4-9. Galaz, V., Global Environmental Governance, Technology and Politics: The Anthropocene Gap, Cheltenham: Edward Elgar Publishing, 2014. Galaz, V., et al., . "'Planetary Boundaries’: Exploring the Challenges for Global Environmental Governance", Current Opinion in Environmental Sustainability 4 (2012), pp 80-87. Nilsson, M., and Å. Persson, "Can Earth System Interactions Be Governed? Governance Functions for Linking Climate Change Mitigation with Land Use, Freshwater and Biodiversity Protection", Ecological Economics 75 (2012), pp 61-71. Wijkman, A. and J. Rockström, Bankrupting Nature: Denying Our Planetary Boundaries, London: Routledge, 2012. Biermann, Frank, "The Anthropocene: A Governance Perspective", The Anthropocene Review 1:1 (2013), pp 57-61. Biermann, Frank, Earth System Governance: World Politics in the Anthropocene, MIT Press, Nov 2014, 296 pp. Publisher. Telos 172: "Political Critiques of the Anthropocene", Fall 2015. Introduction. Subscription access. Yusoff, Kathrin (ed. ), "400ppm: Exit Holocene, Enter Anthropocene" section in Society & Space, Jul 2013. Yusoff, Kathrin, "Geologic Life: Prehistory, Climate, Futures in the Anthropocene", Environment and Planning D: Society and Space 31:5 (2013), pp 779-795. Whitehead, Mark, Environmental Transformations: A Geography of the Anthropocene, Routledge, Apr 2014, xiv+176 pp. "An introduction to the human practices and systems that sustain the Anthropocene." Publisher. Review: Zanetti (Geographical Rev). Castree, Noel, "Geography and the Anthropocene, I-III", Geography Compass 8:7 (Jul 2014), pp 436-476. "Considers the relevance of ‘the Anthropocene’ to present and future research in Geography." Yusoff, Kathrin, "Anthropogenesis: Origins and Endings in the Anthropocene", Theory, Culture & Society 33:2, Mar 2016, pp 3-28. Hornborg, Alf, and Carole L. Crumley (eds. ), The World System and the Earth System: Global Socioenvironmental Change and Sustainability since the Neolithic, Walnut Creek, CA: Left Coast Press, 2006, xii+395 pp. Based on a conference held at Lund University, Sweden, 2003. Reviews: Rick (AnthroSource), Blount (J Ethnobiology), Jones (EH), Lawrence (J World-Systems Research), Sörlin (Scand Econ Hist Rev). Malm, Andreas, "The Origins of Fossil Capital: From Water to Steam in the British Cotton Industry", Historical Materialism 21:1, 2013, pp 15-68. Moore, Jason W., Capitalism in the Web of Life: Ecology and the Accumulation of Capital, Verso, Aug 2015, vii+316 pp. Publisher. Reviews: Wark (Public Seminar), Kunkel (LRB), Hopkinson (Marx & Phil), McKinney (Human Ecol Rev), Boscov-Ellen (Grad Fac Phil J), Nelson (Antipode), Bernstein (J Agrarian Change), Graham-Leigh (Counterfire), Paye (Green Letters), Nayeri (C&C). Malm, Andreas, Fossil Capital: The Rise of Steam Power and the Roots of Global Warming, London: Verso, Jan 2016, 488 pp. Publisher. Reviews: Kunkel (LRB), Vettese (Jacobin), Trimmier (New Inquiry), Finkeldey (Marx & Phil), Tomaney (LSE), Schaffartzik & Fischer‐Kowalski (J Industr Ecol), Parham (Green Letters). Nicholson, Simon, and Sikina Jinnah (eds. ), New Earth Politics: Essays From the Anthropocene, MIT Press, 2016, xiv+442 pp. Publisher. Reviews: Paterson (R Policy Research), Zelli (Global Env Pol). Moore, Jason W., "The Capitalocene, Part I: On the Nature and Origins of Our Ecological Crisis", Journal of Peasant Studies 44:3, 2017, pp 594-630. Visualization. Moore, Jason W., "The Capitalocene, Part II: Accumulation by Appropriation and the Centrality of Unpaid Work/Energy", Journal of Peasant Studies 45:2, 2018, pp 237-279. Woodard, Ben, On an Ungrounded Earth: Towards a New Geophilosophy, Brooklyn, NY: Punctum Books, Mar 2013, 118 pp. Morton, Timothy, Hyperobjects: Philosophy and Ecology after the End of the World, Minnesota UP, Nov 2013, 240 pp. Publisher. Reviews: Heise (Crit Inquiry), Muecke (LA Rev Books), Nazaryan (Newsweek), Golby (Limina), White (Glasgow Rev Books), Daggett (Society & Space), Mušanović (Qui Parle), Leonardi (Reviews in Culture). Deleuze and Guattari Studies 10(4): "Deleuze & Guattari in the Anthropocene", Nov 2016. Subscription access. CfP. Lemmens, Pieter, and Yuk Hui, "Apocalypse Now! Peter Sloterdijk and Bernard Stiegler on the Anthropocene", boundary2, 16 Jan 2017. Stiegler, Bernard, Neganthropocene, ed. & trans. Daniel Ross, London: Open Humanities Press, 2018, 345 pp. Vergès, Françoise, "Racial Capitalocene", in Futures of Black Radicalism, eds. Gaye Theresa Johnson and Alex Lubin, London: Verso, Apr 2017, pp 72-82. South Atlantic Quarterly 116(2): "Autonomia in the Anthropocene", eds. Sara Nelson and Bruce Braun, Apr 2017. Dunlap, Riley E., and Robert J. Brulle (eds. ), Climate Change and Society: Sociological Perspectives, Oxford University Press, 2015, xvii+460 pp. Stockholm Resilience Centre does research on global sustainability. Est. 2007. 10-year report. Momentum Institut, Paris. Established Mar 2011, president Yves Cochet (until Jun 2014 Agnès Sinaï). Devoted to the social implications of the Anthropocene. C3NET: Climate, Culture, Catastrophe Network (Aarhus U, 2014-17). Aims to create and catalyze a Palaeoenvironmental Humanities research, education and outreach cluster at Aarhus University and beyond. AURA: Aarhus University Research on the Anthropocene, draws from anthropology, biology and philosophy. The Shock of the Anthropocene: The Earth, History and Us, trans. David Fernbach, London: Verso, Jan 2016, 320 pp. Publisher. Hamilton, Clive, François Gemenne, Christophe Bonneuil (eds. ), The Anthropocene and the Global Environmental Crisis: Rethinking Modernity in a New Epoch, New York and London: Routledge, May 2015, 188 pp. McNeill, J.R., and Peter Engelke, The Great Acceleration: An Environmental History of the Anthropocene since 1945, Harvard University Press, Apr 2016, 288 pp. Publisher. Latour, Bruno, Facing Gaia: Eight Lectures on the New Climatic Regime, trans. Catherine Porter, Cambridge: Polity, Aug 2017, vii+327 pp. An extended reworking of his 2013 Gifford lectures delivered at Edinburgh University, which explore Gaia as a secular figure through which to understand our current environmental predicament. Publisher. Reviews: Leskanich (LSE), Wark (Verso). Techné: Research in Philosophy and Technology 21(2-3): "Anthropocene", eds. Pieter Lemmens, Vincent Blok, and Jochem Zwier, 2017, 291 pp. Coen, Deborah R., Climate in Motion: Science, Empire, and the Problem of Scale, University of Chicago Press, 2018, xiv+425+ pp. Review: Greene (Nature). Robin, Libby, and Will Steffen, "History for the Anthropocene", History Compass 5:5 (Aug 2007), pp 1694-1719. Aims to "identify potential common interests between historians and non-historians writing world history at very different scales, and for different audiences." The opening keynote of The Anthropocene Project by Dipesh Chakrabarty, HKW, Berlin, Jan 2013. Video. The world's protected areas as of 2015. From the Atlas for the End of the World. 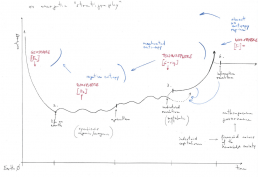 A diagram sketched by Matteo Pasquinelli during the Anthropocene Campus at HKW Berlin to illustrate and simplify the transformation of the entropic regimes across the agricultural, industrial and information revolutions (and the feedback effects on previous technological stages). More. 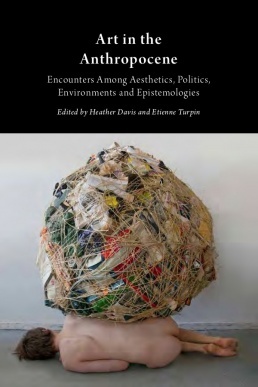 Art in the Anthropocene: Encounters Among Aesthetics, Politics, Environments and Epistemologies, 2015, Log, PDF. Note that most of these publications include contributions from other disciplines as well, and naturally question the 'human' in the humanities. Consult also separate entries on Media ecology and Posthumanities. Ellsworth, Elizabeth, and Jamie Kruse (eds. ), Making the Geologic Now: Responses to Material Conditions of Contemporary Life, Brooklyn, NY: Punctum Books, Dec 2012, 260 pp. Images and short essays from over 40 artists, designers, architects, scholars, and journalists offering "early sightings of an increasingly widespread turn toward the geologic as source of explanation, motivation, and inspiration for creative responses to material conditions of the present moment." Publisher. The Whole Earth: California and the Disappearance of the Outside, eds. Diedrich Diederichsen and Anselm Franke, Berlin: Sternberg Press & Haus der Kulturen der Welt, 2013, 208 pp. With contributions by Sabeth Buchmann, Mercedes Bunz, Diedrich Diederichsen, Kodwo Eshun, Anselm Franke, Erich Hörl, Norman M. Klein, Maurizio Lazzarato, Flora Lysen, Eva Meyer, John Palmesino, Laurence Rickels, Bernd M. Scherer, Fred Turner. Publisher. Publisher. Turpin, Etienne (ed. ), Architecture in the Anthropocene: Encounters Among Design, Deep Time, Science and Philosophy, Ann Arbor: Open Humanities Press, Dec 2013, 250 pp. Zylinska, Joanna, Minimal Ethics for the Anthropocene, Open Humanities Press, Sep 2014. Klingan, Katrin, Ashkan Sepahvand, Christoph Rosol, Bernd M. Scherer (eds. ), Textures of the Anthropocene: Grain Vapor Ray, 3+1 vols., Berlin: Revolver, Oct 2014, 328 + 280 + 336 + 80 pp; MIT Press, Jan 2015. Excerpts: Wilkins & Tresch (from v2), Lysen (from v3), Szerszynski (from v3). TOC, TOC, Publisher, Publisher. Reviews: Ickert (Leonardo), Doove (Leonardo). Anthropocene Milestones: Illustrating the Path to the Age of Humans, 2014. Parikka, Jussi, The Anthrobscene, Minnesota UP, Nov 2014, 60 pp. "Critiques the environmental destruction caused by media technologies in the anthropocene era." Publisher. Velden, Lucas van der, Mirna Belina, Arie Altena, and Sonic Acts (eds. ), The Geologic Imagination, Amsterdam: Sonic Acts, Jan 2015, 336 pp. Incl. essays by Morton, Kahn, Bogard, Welland, and Ganchrow, interviews, visual contributions and a sound work. Publisher. Weizman, Eyal, and Fazal Sheikh, The Conflict Shoreline: Colonization as Climate Change in the Negev Desert, Göttingen: Steidl, and Brooklyn, NY: Cabinet, May 2015, 96 pp. Publisher, Publisher. Interview. Reviews: Wark (Public Seminar), Cacioppo (Muftah), Lambert (Uncube). Wark, McKenzie, Molecular Red: Theory for the Anthropocene, London: Verso, 2015, xxiv+280 pp. Wark, McKenzie (ed. ), Molecular Red Reader, London: Verso, 2015, 85 pp. Parikka, Jussi, A Geology of Media, Minnesota UP, Apr 2015. "Argues that to adequately understand contemporary media culture we must set out from material realities that precede media themselves—Earth’s history, geological formations, minerals, and energy." Earlier essay, Talk (Jan 2013), Publisher. Cohen, Tom, Claire Colebrook, J. Hillis Miller, Twilight of the Anthropocene Idols, London: Open Humanities Press, 2016, 220 pp. Review: van Rijn (Open). Belina, Mirna (ed. ), Living Earth: Field Notes from the Dark Ecology Project 2014-2016, Amsterdam: Sonic Acts, Jun 2016, 256 pp. Excerpt. Based on Dark Ecology project. Review: Jones (Open). Demos, T.J., Decolonizing Nature: Contemporary Art and the Politics of Ecology, Berlin: Sternberg Press, Jul 2016, 296 pp. TOC & Introduction. Publisher. Reviews: Mulvogue (J Visual Culture), Elwes (MIRAJ). Holmes, Brian, Driving the Golden Spike: The Aesthetics of Anthropocene Public Space, Deep Time Chicago, 2016, 19 pp. Pamphlet. Brits, Baylee, Prudence Gibson, and Amy Ireland (eds. ), Aesthetics After Finitude, afterw. Justin Clemens, Melbourne: re.press, Dec 2016, 241 pp. Based on 2015 conference. Grusin, Richard (ed. ), Anthropocene Feminism, University of Minnesota Press, Mar 2017, 233 pp. Based on 2014 conference, Video from closing roundtable. Publisher. Reviews: Sandilands (LA Rev Books), Doove (Leonardo), Lewis Hood (Glasgow Rev Books). Demos, T.J., Against the Anthropocene: Visual Culture and Environment Today, Berlin: Sternberg Press, Jul 2017, 132 pp. Publisher. Reviews: Daniels-Yeomans (Media Theory), Volz (CAA). Springer, Anna-Sophie, and Etienne Turpin (eds. ), The Word for World Is Still Forest, Berlin: K. Verlag & Haus der Kulturen der Welt, 2017, xix+202 pp. Thorsen, Line Marie (ed. ), Moving Plants, Næstved: Narayana Press, 2017, 159 pp. Companion book to the exhibition. TOC & Introduction, , . Nitzke, Solvejg, and Nicolas Pethes (eds. ), Imagining Earth: Concepts of Wholeness in Cultural Constructions of Our Home Planet, Bielefeld: transcript, 2017, 172 pp. Zylinska, Joanna, The End of Man: A Feminist Counterapocalypse, University of Minnesota Press, Mar 2018, 78 pp. Manuscript. Publisher. Gadanho, Pedro (ed. ), Eco-Visionaries: Art, Architecture, and New Media after the Anthropocene, Berlin: Hatje Cantz, 2018, 176 pp. Accompanies the touring exhibition. Texts by Amale Andraos, T.J. Demos, Matthew Fuller, Sabine Himmelsbach, Sofia Johansson, Karin Ohlenschläger, Mariana Pestana, Yvonne Volkart, Linda Weintraub. Publisher. Review: Debatty (WMMNA). Critical Art Ensemble, Aesthetics, Necropolitics, and Environmental Struggle, Brooklyn, NY: Autonomedia, 2018, 167 pp. Critical Climate Change, eds. Tom Cohen and Claire Colebrook, Open Humanities Press, since 2011. Anthropocène, ed. Christophe Bonneuil, Paris: Seuil, since Oct 2013. Titles. Intercalations: A Paginated Exhibition Series, eds. Anna-Sophie Springer and Etienne Turpin with Kirsten Einfeldt and Daniela Wolf, Berlin: Haus der Kulturen der Welt and K. Verlag, since Jan 2015. Titles, . CCC2 Irreversibility, eds. Tom Cohen and Claire Colebrook, Open Humanities Press, since 2018. Art after Nature, eds. Giovanni Aloi and Caroline Picard, University of Minnesota Press, since 2018. The Distance Plan, eds. Amy Howden-Chapman and Abby Cunnane, Auckland: Distance Plan Press, since 2013, Log. Technosphere Magazine, eds. Katrin Klingan and Christoph Rosol, Berlin: Haus der Kulturen der Welt (HKW), since 2016, Log. Explores the amorphous fabric of technologies, environments, and humans shaping Earth's critical future. Oxford Literary Review 34(2): "Deconstruction in the Anthropocene", Edinburgh UP, Dec 2012. Texts by Timothy Clark, Bronislaw Szerszynski, Claire Colebrook, Louise Squire, Timothy Morton, Tom Cohen, Nigel Clark, Sam Solnick, Adam Trexler, and Maebh Long. Subscription access. Environmental Humanities, vol. 5: Special section: "Imagining Anew: Challenges of Representing the Anthropocene", eds. Greg Garrard, Gary Handwerk and Sabine Wilke, 2014. Texts by Boes, Lekan, Mossner, Struck. Public Culture 26(2): "Environmental Visualization in the Anthropocene: Technologies, Aesthetics, Ethics", eds. Allison Carruth and Robert P. Marzec, Spring 2014. Introduction, DeLoughrey, Houser, Subscription access. Investigates contemporary media technologies and tactics of environmental visualization: satellite imaging of nuclear contamination (DeLoughrey), animated films about nonhuman animals (Heise), landscape paintings (Mirzoeff), infographics (Houser), ecological metaphors that obscure the Internet’s environmental ramifications (Carruth) and sensational photographs that privilege the “view from above” (Marzec). Continent. 5(2): "The Technosphere, Now", eds. Nina Jäger, Paul Boshears, Bernhard Garnicnig, Jamie Allen, Lital Khaikin, Katrin Klingan, Anna Sophie Luhn, Christoph Rosol, and Nick Hood, Apr 2016. Concentric 43(1): "The City and the Anthropocene", eds. Simon C. Estok and Shiuhhuah Serena Chou, Mar 2017. Wark, McKenzie, essays on the Anthropocene, Public Seminar, Jun 2014-. Pasquinelli, Matteo, The Eye of the Algorithm: Cognitive Anthropocene and the Making of the World Brain, 2014. Booklet. Pirici, Alexandra, and Raluca Voinea, "Manifesto for the Gynecene: Sketch of a New Geological Era", Bucharest and Bologna, Jan 2015, PDF. Chun, Wendy Hui Kyong, "On Hypo-Real Models or Global Climate Change: A Challenge for the Humanities", Critical Inquiry 41:3, Spring 2015, pp 675-703. Haraway, Donna, "Anthropocene, Capitalocene, Plantationocene, Chthulucene: Making Kin", Environmental Humanities 6, 2015, pp 159-165. Video talk, Video interview. Helmreich, Stefan, "Hokusai's Great Wave Enters the Anthropocene", Environmental Humanities 7, 2015, pp 203-217. "Manifestofos", trans. Vít Bohal, Frontiers of Solitude, . Holmes, Brian, a.o., "Foundations for 'Anthropocene Socialist' Movement", Nettime, Dec 2018-Jan 2019, cont..
Wenzel, Jennifer, "Climate Change", in State of the Discipline Report: Ideas of the Decade, American Comparative Literature Association, 3 Mar 2014. Goudie, Andrew, "Anthropocene", in Oxford Bibliographies Online, Jul 2017. Anthropocene Resources, Energy Cultures in the Age of the Anthropocene symposium, 2015. Atlas for the End of the World: Atlas for the Beginning of the Anthropocene, a resource by Richard Weller with Claire Hoch and Chieh Huang, Department of Landscape Architecture, U Pennsylvania, 2015. Friends of the Pleistocene blog, est. 2010. A project of Smudge Studio (Elizabeth Ellsworth and Jamie Kruse). An Anthropocene Primer, eds. Jason M. Kelly and Fiona P. McDonald. Launched Oct 2017. Emerged out of a workshop hosted by the IUPUI Arts and Humanities Institute, Indianapolis, in May 2017. Elise Misao Hunchuck, Reading the Anthropocene, 2017ff. @AnthropoceneBot, crawling the web for mention of the Anthropocene. Created by @ianalanpaul. Generation Anthropocene, a working group at Stanford U. Features podcasts and essays. Note the links to video documentation of respective events. Anthropocene Humanities, Humanities Research Centre, Australian National University, Canberra, 13-16 Jun 2012. The 2012 Annual Meeting of the Consortium of Humanities Centers and Institutes. Where Are We Going, Walt Whitman? An Ecosophical Roadmap for Artists and Other Futurists, conference festival, Gerrit Rietveld Academie, Amsterdam, 12-15 Mar 2013; weekly lectures 14 Nov 2012-27 Feb 2013. Videos. Review: Haest (Metropolis M). The Anthropocene Project, Haus der Kulturen der Welt (HKW), Berlin, Jan 2013-8 Dec 2014. Event series. Videos, Videos, Report (booklet). Culture and the Anthropocene, Rachel Carson Center and IBZ, Munich, 14-16 Jun 2013. The Whole Earth, Haus der Kulturen der Welt (HKW), Berlin, 21-22 Jun 2013. Curated by Diedrich Diederichsen and Anselm Franke. Thinking the Anthropocene, Paris, 13-15 Nov 2013. Jointly organised by Sciences Po, EHESS (Centre Alexandre Koyré), the University of Versailles Saint-Quentin-en-Yvelines, the National Museum of Natural History and the Ministry of Ecology, Sustainable Development and Energy. Transformation without Apocalypse: How to Live Well on an Altered Planet symposium, Oregon State University, Corvallis, OR, 14-15 Feb 2014. Videos. Anthropocene Feminism, Center for 21st Century Studies (C21) at University of Wisconsin-Milwaukee, 10-12 Apr 2014. Incl. videos (Povinelli, Jeremijenko, Hird, Alaimo, Spahr, Colebrook, concluding roundtable). Anthropocene: Arts of Living on a Damaged Planet, Santa Cruz, 8-10 May 2014. Incl. videos. Organised by Anna Tsing; part of AURA. Nature After Nature symposium, Fridericianum, Kassel, 5 Jul 2014. Accompanying program to exhibition. Videos. The Thousand Names of Gaia: From the Anthropocene to the Age of the Earth, Rio de Janeiro, 15-19 Sep 2014. Videos, Papers. The Anthropocene Project. A Report, Haus der Kulturen der Welt (HKW), Berlin, 16 Oct-8 Dec 2014. Program of events. Life After the Anthropocene, seminar series, organised by Jamie Lorimer and Jamie Castell, Torch, U Oxford, 2014-15. Im/mortality and In/finitude in the Anthropocene: Perspectives from the Environmental Humanities, Environmental Humanities Laboratory, Royal Institute of Technology, Stockholm, 2-4 Dec 2014. Sonic Acts 2015 Conference, Paradiso, Amsterdam, 26 Feb-1 Mar 2015. Energy Cultures in the Age of the Anthropocene, Obermann Humanities Symposium, 5-7 Mar 2015. Inhuman symposium, Fridericianum, Kassel, 25 May 2015. Accompanying program to exhibition. Videos. Geographies of the Anthropocene, U Exeter, 1-4 Sep 2015. Chair: Sarah Whatmore. Dump! Multispecies Making and Unmaking, Aarhus U, 5-6 Sep 2015. Catastrophe, Cataclysm and the Singular Accident, Winnipeg Cinematheque, Winnipeg, 15 Nov 2015. Accompanying program to exhibition. Mutating Ecologies in Contemporary Art symposium, MACBA Museum of Contemporary Art, Barcelona, 1 Dec 2016. Coordinated by Christian Alonso. Anthropocene Lectures, HKW & Max Planck Institute for the History of Science, Berlin, 2017-2018. Incl. videos (follow links to respective artists). Agents in the Anthropocene: Trans/Disciplinary Practices in Art and Design Education Today conference, Rotterdam, 27-28 Jan 2017. Videos, PDFs. Ephemeropteræ 2017: An Evocative Exploration of Oceanic Sciences, Aquatic Soundscapes, and Speculative Poetics, Augarten Park, Vienna, Jun-Sep 2017. Part of the annual spoken-word performance series; accompanies the Tidalectics exhibition. Organised by Thyssen-Bornemisza Art Contemporary. Curated by Daniela Zyman and Boris Ondreička with Stefanie Hessler and Markus Reymann. Mutating Ecologies in Contemporary Art: Second International Symposium, MACBA Museum of Contemporary Art, Barcelona, 21 Feb 2018. Ars Electronica: Human Nature, Linz, 3-8 Sep 2009. Art festival. Rethink: Contemporary Art & Climate Change, National Gallery of Denmark, 31 Oct-5 Apr 2009; Den Frie Centre of Contemporary Art, 31 Oct-27 Dec 2009; Nikolaj Copenhagen Contemporary Art Center, 31 Oct 2009-10 Jan 2010; Moesgård Museum, 31 Oct 2009-7 Mar 2010; Tensta Konsthall, Stockholm, 20 Feb-10 Apr 2010; Cinema Planeta Film and Environment Festival, Cuernavaca, Mexico, 5-14 Mar 2010; Rogaland Kunstmuseum, Stavanger, 20 Aug-21 Nov 2010. Collaboration between the National Gallery of Denmark, Den Frie Centre of Contemporary Art, Nikolaj Copenhagen Contemporary Art Center and the Alexandra Institute. Review: Bunting (Guardian). Anthropocene Observatory, Haus der Kulturen der Welt, Berlin, 26 Apr 2013-8 Dec 2014. Series of four exhibitions (Plan the Planet; Empire of Calculus; Down to Earth; The Dark Abyss of Time). Project by Armin Linke, Territorial Agency (John Palmesino and Ann-Sofi Rönnskog), and Anselm Franke. Videos. The Whole Earth: California and the Disappearance of the Outside, Haus der Kulturen der Welt, Berlin, 26 Apr-7 Jul 2013. Curated by Diedrich Diederichsen and Anselm Franke. In the framework of The Anthropocene Project. Recording the Anthropocene, Perkins Library Gallery, Duke University, 16 Jul-13 Oct 2013. Suicide Narcissus, Renaissance Society, Chicago, 15 Sep-15 Dec 2013. Nature After Nature, Fridericianum, Kassel, 11 May-27 Jul 2014. Curated by Susanne Pfeffer. The Great Acceleration: Art in the Anthropocene, curated by Nicolas Bourriaud, Taipei Biennial, Sep 2014-Jan 2015. Review: McLean-Ferris (Art Agenda). Anthropocene Monument, les Abattoirs, Toulouse, 3 Oct 2014-4 Jan 2015. Prepared by Bruno Latour and Bronislaw Szerszynski. Dark Ecology, Kirkenes (NO), Nikel (RU) and Zapolyarny (RU), 9-12 Oct 2014 & 26-30 Nov 2015 & 8-12 Jun 2016. A project by Sonic Acts and Hilde Methi. Curated by Arie Altena, Nicky Assmann, Mirna Belina, Martijn van Boven, Femke Herregraven, Gideon Kiers, Hilde Methi, Lucas van der Velden, Annette Wolfsberger. Extinction Marathon: Visions of the Future, Serpentine Sackler Gallery, London, 18-19 Oct 2014. Curated by Hans Ulrich Obrist, Gustav Metzger, et al. Online companion. Welcome to the Anthropocene - The Earth in Our Hands, Deutsches Museum, Munich, Dec 2014-Jan 2016. Video: History of the Anthropocene Concept, 5 min. Anthropocene Observatory, BAK, Utrecht, 7 Feb-26 Apr 2015. Developed by Territorial Agency (John Palmesino and Ann-Sofi Rönnskog), Armin Linke, and Anselm Franke. Rare Earth: Geology and Media, Thyssen-Bornemisza Art Contemporary, Vienna, 19 Feb-31 May 2015. Curated by Boris Ondreička and Nadim Samman. Placing the Golden Spike: Landscapes of the Anthropocene, INOVA (Institute of Visual Arts), University of Wisconsin-Milwaukee, 26 Mar-13 Jun 2015. Curated by Dehlia Hannah and Sara Krajewski. Inhuman, Fridericianum, Kassel, 29 Mar-14 Jun 2015. Curated by Susanne Pfeffer. Dump! Multispecies Making and Unmaking, Kunsthal Aarhus, Aarhus, 26 Jun-20 Sep 2015. Curated by Elaine Gan, Steven Lam and Sarah Lookofsky. Coorganised by AURA project. Workshop. Earth Machines, Yerba Buena Center for the Arts, San Francisco, 14 Aug-6 Dec 2015. Curated by Ceci Moss. Brochure. Reviews: Middleman (CAA), Santos (Hyperallergic). Climats artificiels, Espace EDF, Paris, 4 Oct 2015-28 Feb 2016. The Age of Catastrophe, Actual Contemporary, Winnipeg, 13 Nov-12 Dec 2015. Curated by Melentie Pandilovski and Tom Kohut. Mild Apocalypse, Moesgård Museum, Aarhus, 4 Feb-4 Jun 2016. Curated by Nathalia Brichet, Felix Riede and Frida Hastrup. Coorganised by AURA project, C3NET, and Natural Goods. Frontiers of Solitude, Školská 28 Gallery, Galerie Fotograf, and Ex Post, Prague, 4 Feb-4 Mar 2016; Vysočina Regional Gallery, Jihlava, 31 Mar-29 May 2016; Dům umění, Ústí nad Labem, 7 Sep-22 Oct 2016. Curated by Ivar Smedstad, Julia Martin and Dana Recmanová. Weather or Not, MU, Eindhoven, 1 Jul-25 Sep 2016. Co-curated by Hanneke Wetzer. Collecting Europe, V&A Museum, London, 1-7 Feb 2017. Twelve artists were commissioned to imagine what Europe might look like 2,000 years from now. Antarctic Pavilion, Palazzo Molin a San Basiego, Venice, 12 May-31 Jul 2017. Incorporates artistic, scientific and philosophical methodologies to explore shared spaces such as Antarctica, the Ocean and the Outer Space. Commissioned by Alexander Ponomarev, curated by Nadim Samman. Tidalectics, Thyssen-Bornemisza Art Contemporary, Vienna, 2 Jun-19 Nov 2017. Curated by Stefanie Hessler. Pushing Buttons, Urban Glass, Brooklyn, NY, 24 Jan-10 Mar 2018. Curated by Benjamin Wright. Review: Liberty (Hyperallergic). Living Earth 2018, Murmansk, Oslo and Kirkenes, 1 Feb-2 Jun 2018. Curated by Sonic Acts and Hilde Methi. Follow-up to Dark Ecology project. This Rare Earth: Stories from Below, Leuven, 14 Feb-1 Mar 2018. Eco-Visionaries: Art and Architecture after the Anthropocene, MAAT—Museu de Arte, Arquitetura e Tecnologia, Lisbon, 10 Apr-8 Oct 2018; Bildmuseet, Umea, 15 Jun-21 Oct 2018; HeK—House of Electronic Arts, Basel, 30 Aug-11 Nov 2018; LABoral, Gijon, 28 Sep 2018-22 Apr 2019. Anthropocene, Art Gallery of Ontario, Toronto, 28 Sep 2018-6 Jan 2019. Review: Brady (Hyperallergic). The Most Beautiful Catastrophe, CSW Kronika, Bytom, Poland, 1 Dec 2018-4 Jan 2019. Curated by Jakub Gawkowski in collaboration with Katarzyna Kalina. ↑ Zalasiewicz et al. 2011. This page was last modified on 4 April 2019, at 11:02. This page has been accessed 20,541 times.